The thoughtful story of a young artist's journey to self-expression, featuring the rising Anglo-French actor Finnegan Oldfield in the titular role, and Isabelle Huppert as… Isabelle Huppert. As he prepares to launch his one-man show on a Paris stage, Marvin is still working through the events that inspired it. Raised in a working-class family, the teen Marvin (Jules Porier) felt at odds with his earthy parents (Catherine Salee and Gregory Gadebois). Cruelly bullied at school for being different, he gets support from an understanding teacher (Catherine Mouchet) who steers him to drama school. 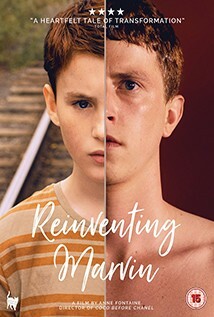 Through all of this, the gnawing question of identity roars through Marvin's mind: is he a product of his parents or someone unique despite the environment he grew up in? As the film progresses, we come to realize how life experiences can be woven into a work of art.